It's October in the genteel city of Charleston, South Carolina, and tea shop owner Theodosia Browning is not only busy with her regular business, but there's an important catering job to plan and carry out with aplomb: the city's annual candlelight historic homes tour. Unfortunately, while the blackberry scones were a hit with the partygoers, Theodosia's tea gets a bad reputation when one of the guests is found to have dropped dead over his cup and saucer. That's the set up for the first book in author Laura Childs' Tea Shop Mystery series, Death by Darjeeling, and the current selection of the online foodie book club Cook the Books. 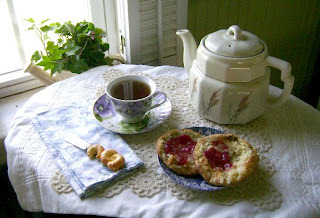 I am hosting this round of Cook the Books and am collecting submissions until July 30, 2012, after which time our guest judge, author Laura Childs herself, will be picking a winner to receive the coveted Cook the Books winner's badge and a copy of her latest Tea Shop mystery (#13), Agony in the Leaves. Cook the Books participants read the featured book, blog about it, and then cook up something inspired by their reading. New participants are always welcome, so feel free to stop by Cook the Books to find out more about the fun. This is the quintessential cozy mystery, full of atmosphere, a fairly bloodless crime, quirky characters and then there's the interesting tidbits about tea making, tea varieties and the mouthwatering Indigo Tea Shop tea time treats! For my Death by Darjeeling entry, I was inspired to make up a basket of crumpets. Now, before last week I couldn't tell you the difference between a crumpet and a trumpet, but after a little tea-soaked research (several cuppas in hand while I pored through my cookbook collection and looked online) it appears that the crumpet originated as very holey griddle cake that morphed into something a bit grander and yeastier on Victorian tea tables. They have been described as the love child of a pancake and an English muffin, with the main point being that there must be many, many airy pockets in the crumpet either on the top side or within, when split, that must be slathered with butter, jam, honey or golden syrup. 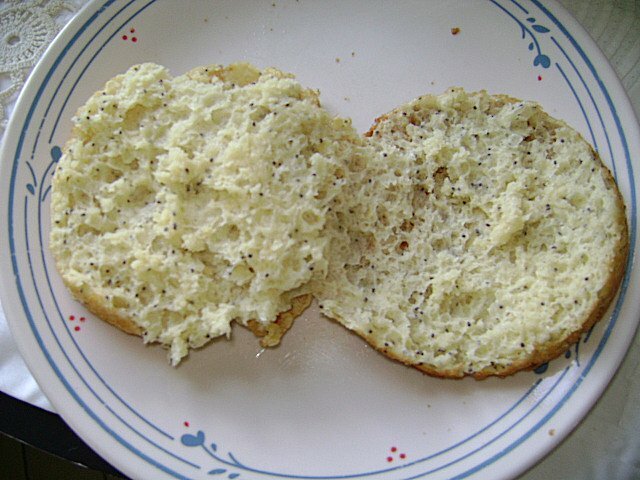 I found a recipe for Gluten-Free crumpets in the 2006 edition of the Glens Falls Regional Celiac Support Group cookbook "Tried and True Recipes", and with a little adjustment here and there, I made a very satisfactory batch of these fluffy little tea accompaniments. Just look at those gorgeous little air pockets above! These crumpets were so good straight out of the oven, split and served up with softened butter and some homemade strawberry jam, but they were just as good the next day when we toasted them and used them for sandwich buns. Mix warm water, yeast and 1 tsp. sugar together and let stand in warm place until foamy, about 5-10 minutes. Grease 6 egg rings or English muffin rings (I bought egg rings with the handles above pretty cheaply at a restaurant supply store, but you could also make your own from carefully cutting and filing down the rough edges of some small, 3 inch diameter, tin cans, like the ones you buy tuna fish, pineapple rings or clams in). Place greased rings on a baking parchment-lined baking sheet. Whisk together chickpea flour, cornstarch, tapioca starch, xanthan gum, salt and egg replacer until well blended. If your chickpea flour comes out of the bag in small clumps, make sure to run it through a sieve first to make sure the flours will blend smoothly). In a large mixing bowl, blend together 1Tbsp. sugar, egg, melted butter, vinegar, poppyseed and yeast-water. Beat in 1/3 of the dry ingredients and beat until smooth. Add in another third and then blend and repeat until dough is silky. It will be a bit moist, but then when you divide it and pour it into the greased rings, they will contain the dough and give it its shape when it rises and bakes. Cover dough in the rings with, what else, a tea towel, and let it rise in a warm place, until the batter doubles (30-45 minutes). Preheat oven to 375 degrees F. Bake your crumpets for 18-20 minutes or until browned on top and crumpets have pulled away slightly from their metal girdles. Makes 6 large crumpets. May be eaten hot or cold. Store in airtight container once cooled. Having a spot of tea (lemon balm from the garden) with these crumpets on the side made for such a civilized afternoon break; almost as good as a Hobbit's Second Breakfast. And this project made for good excuse to break out some underutilized linens and doilies to make our tea break even more enjoyable. One thing about crumpets. There appears to be some very naughty British slang usage for the term tea and crumpets, something Theodosia and Company would not likely approve of, so be forewarned, my fellow Americans, before you start spouting off about how much you are looking forward to eating these in bed or something else potentially embarrassing. 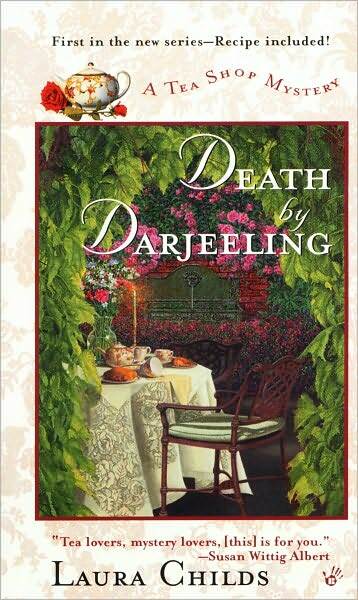 I hope you will join my booking and cooking friends in reading Death by Darjeeling (I've devoured books no. 2 and 3 in the series already and am savoring the thought of diving into no. 4 later this week) and joining us at Cook the Books. I will post the roundup of all the posts for this book selection shortly after the July 30 deadline over at the CTB website, so be sure to pop on by for a spot of tea and some good reading. The love child of a pancake and an english muffin - HA! Such a fun post. I don't know that I've ever actually eaten a crumpet before...though I'm pretty sure I could tell one from a trumpet ;P. These sound lovely. "Crumpet" is a term for an attractive lady but I don't know this naughty slang usage! Intriguing! My understanding of the naughty crumpet was closer to the meaning of strumpet. Love them though, the foodie ones. I've made a sourdough version, after a difficult time getting the tins. Good post and selection for CTB, Rachel. Tea and crumpets? Of course! Perfect pairing and yours look very light and fluffy. 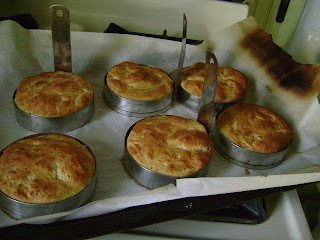 Tea and jam and one of these and a good mystery tea novel---wonderful pairing indeed. Nice job! My first and so far only attempt with crumpet was a veritable disaster, but sooner of later I'll try again. Your crumpets look so pretty. Wonderful post and review Rachel and I am so impressed with your GF crumpets too! Loved the post, and now I want to read the book! However, what is in your picture is NOT a crumpet. For one thing, crumpets are baked on a griddle or in a frying pan, not in the oven. They are made from a fairly thin yeast batter that bubbles up as it cooks, creating wonderful nooks and crannies for butter to melt into. They are too thin to be split before toasting, and far too delicate in texture. I saw a similar recipe in one of Bette Hagman's books, and having tried it, have to say that they are lovely little buns, but Not crumpets.